Does your kid find his science lectures boring? Do you want to increase your child’s knowledge about the animal kingdom in a fun way? Then why don’t you give him interesting animal coloring sheets? 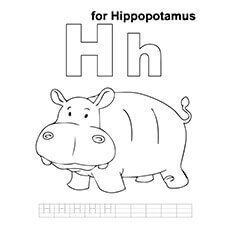 Let’s start with Hippopotamus coloring pages. Hippos have always generated curiosity among children with its distinct features and large physical structure. These large mammals from swampy areas spend much of their time in the water. The water keeps their temperature down and their skin from drying out. They emerge from the water at night to graze. 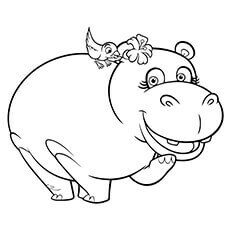 Here are ten cute hippo coloring pages printable with some interesting facts. It also includes some famous hippo cartoon characters. Your child is sure to have a great time with them. 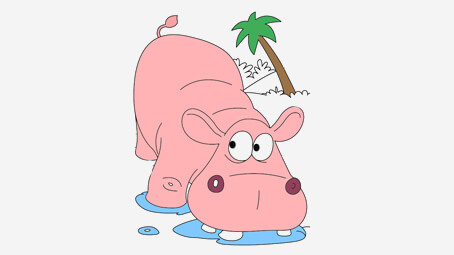 Here is an easy coloring sheet of a hippopotamus wading in the water. 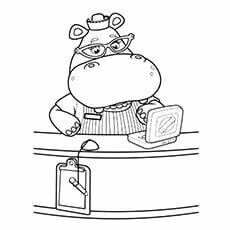 Your child can color this hippo in dark gray or black. And if he wants to make it make it stand out, then he can use pink, orange, blue or whatever color he likes. Did you know that hippopotamus are close relatives of whales? We bet you didn’t know this. Letter recognition coloring sheets never looked so much fun. 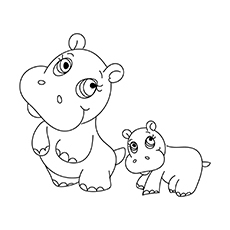 Have your child trace the letter on his coloring sheet and the color the hippo. Ask him to name other animals starting with the letter ‘H’. Do not forget to reward him after the coloring session. It will boost his confidence. 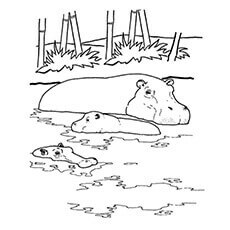 Brighten your kid’s day with this coloring sheet featuring a mama hippo with her baby. Both are keeping them cool by taking a dip in the water. Your child will enjoy bringing this mommy-baby duo to life with his coloring set. Gloria is a hippopotamus from the film “Madagascar”. She resides in the Central Park Zoo as one of the star attractions. She is the tritagonist of the film and a great friend of Melman, Alex, and Marty. Just like a common hippo, Gloria is a gray colored hippo with an enormous belly. But her huge belly often causes problems for her. Have you even seen a dancing hippo? If no, then you must meet Hyacinth. Hyacinth is a hippo from Disney’s film “Fantasia”. Being the lead dancer of the movie, she symbolizes Laura Adorna of the opera. 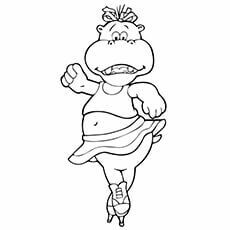 She is a sweet and loving hippo who wears a yellow tutu paired with golden ballet slippers. 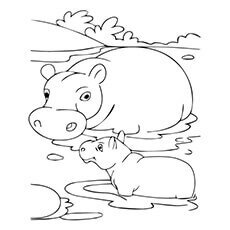 Here is one of the cutest baby hippo coloring pages, featuring a pygmy hippo. A pygmy hippo is substantially smaller in size than the other species of hippos. Just like the common hippos, pygmy hippos predominantly feed on sedges, ferns, fruits and grasses. 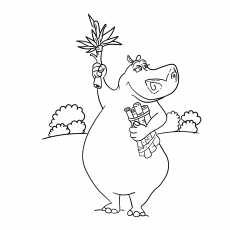 After coloring the hippo, have your child make a background like trees, river or a forest. The picture will look lovely when done. Lizzie is the character from the popular children’s board game “Hungry Hungry Hippos”. The coloring sheet features Lizzie with her bestie Birdie. Don’t you think she looks amazingly cute? Hallie the hippo is one of Doc’s friends in Disney’s series “Doc MacStuffins. Hallie is an adorable purple hippo who wears a red and white striped apron, a white shirt, a red hat and red glasses. She is a nurse in the toy clinic. Hallie seems a little tomboyish with the way she talks in her Texas accents. Hippos are graceful swimmers. Here is a coloring sheet of a hippo swimming with his pod. He is trying to stay cool in the scorching heat. At night, these hippos will leave the water to graze on the grassland. Teach your child more about this calm animal as he colors the sheet. Encourage your child to go to school with this cute coloring sheet. It features a baby hippo going to his school. He looks very elegant in his school uniform. Put your child’s stellar work on display for everyone to see. 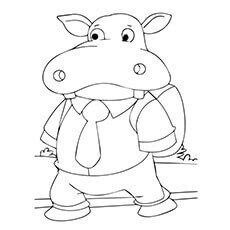 Your child will relate more to the wild animals after coloring these free printable Hippo coloring pages. 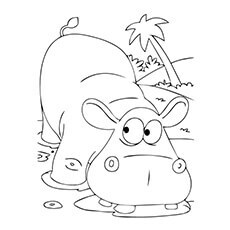 You can also print out these hippo coloring sheets. It will be useful in your child’s projects. Who is your child’s favorite wild animal?